As a charter member of the Belarus SIG, this group is dear to Tracing the Tribe’s genealogical heart. Belarus SIG began life as a crowded birds-of-a-feather meeting spearheaded by Daveid Fox, at the Boston 1996 conference and became a SIG at the 1998 Los Angeles event. The speaker in Boston was a then-recent Mogilev immigrant to Brooklyn, Bella Nayer, who had been very involved in community affairs. 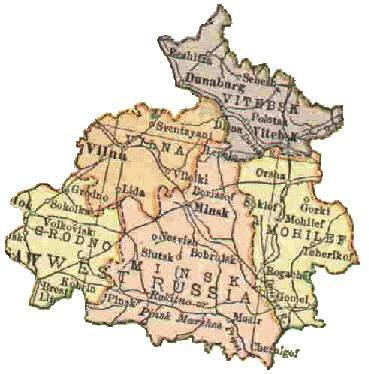 The map (above left) is a 1916 map of Belarus. 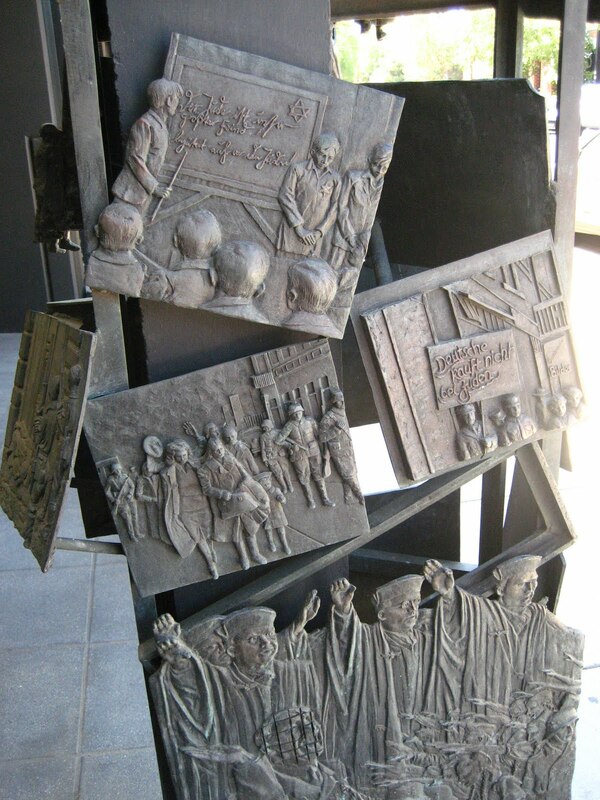 The graphic (below right) is a woodcut of the Mogilev synagogue. What does the SIG have planned for its return to its birthplace? Tracing the Tribe has already covered the Belarus luncheon (Tuesday, July 13) speaker: Moscow born, Jewish filmmaker, researcher and travel professional Michael Masterovoy. The luncheon is a fee-added event. Belarus SIG luncheons are always well-attended – sign up early and avoid disappointment. The Belarus SIG business meeting is set for later the same day and will feature the group’s progress and achievements. The group also plans to be part of the Sunday opening day Market Fair, from 2-4.30pm. The Market Fair will feature experts and mavens staffing “pushcarts” and offering assistance and guidance, representing nearly every region where Jews once lived. “Wares” will include old maps, vital records, landowner records, historical photos and postcards, translation, crafts, cooking and much more. Food (including kosher) will be available for purchase. And don’t miss the great klezmer concerts (yes – two of them!) by Yale Strom and Hot Pstromi, after the Market Fair and again in the early evening. For more information on the Belarus SIG, its treasure trove of databases and much more, click here. Take a look at what our families eat at special occasions, holidays or lifecycle events. We tend to recreate the “warm fuzzies” of our childhood customs and traditions which, in turn, were part of the everyday life of our immigrant ancestors. In my grandmother’s Brooklyn kitchen was a knife that always looked primitive to my American eyes, its large blade needed constant sharpening and it had a worn wooden handle. There were cast-iron frying pans, a dual chopper (today called a mezzaluna), a scarred wooden bowl (used with the chopper). The knife, frying pans, chopper and wooden bowl found their way to my mother’s kitchen and some of them wound up in my kitchen. The knife was made by my great-grandfather, and I heard other family stories about the provenance of other items. Lots of chopped liver was made in that wooden bowl with that mezzaluna. Blintzes came out of those blackened frying pans. The Philadelphia Inquirer’s “Food tells a family story” demonstrates how traditions keep family history alive through the generations. It details the 1891 trip of the author’s great-great-grandmother who arrived from Sweden with a suitcase and two children to join her husband in Missouri. In the suitcase were a knive and rolling pin. The story quotes Dawn Orsak, a Texas food expert, on the importance of food history. Almost 120 years later, the sturdy black-handled knife with razorlike teeth and the long, smooth rolling pin are still in use in my grandmother’s kitchen, less than 40 miles from where her grandmother first unpacked them after the long journey. “You don’t see anything like it this day and age,” my grandmother said of the knife. “It’s never been sharpened. Doesn’t need it. Only thing I ever use it for is to cut angel food cake and bread, of course.” She went on to explain that her mother used the knife to cut coffeecake during Scandinavian club meetings she hosted in the 1930s. My sister and I have old cookbooks with recipes and notes in our mother’s handwriting. Just reading them brings back the memories. Some recipes were successes and family favorites, while others not so successful. One recipe not recorded – thank heaven for small miracles – was developed when my mother got a new kitchen gadget (a blender) and decided to make tuna fish salad in it. Not a good idea. I do remember Mom adding lots of matzo meal and making tuna patties instead. They were pretty good. But the “tuna fish salad soup” was never attempted again. “Some people are after recipes, but I’m after stories,” says Orsak, who specializes in recording history through food traditions. From generation to generation, we pass down food traditions, habits, recipes, cookbooks, and even utensils that carry with them historical details as unique as our genetic code, but many of us don’t think to record that history. My grandmother would visit us in the Bronx after a long subway ride from Brooklyn, laden with jars, boxes and shopping bags. I guess she thought we didn’t have food in the wilds of the Bronx. Knaidlach, soup, chopped liver, stuffed cabbage and more came out of those bundles. Of course, Tracing the Tribe is also guilty of the same thing. When our daughter went off to Brown University, I visited her one weekend during her first year. My cross-country suitcases contained 10 pounds of frozen saffron-lemon-onion marinated broiled Persian jujeh kabob (breast meat chunks), a large container of frozen mosama bademjan (beef in an eggplant-tomato-cinnamon sauce), along with a large first-cut kosher brisket that I would cook that weekend in the Brown Hillel kitchen. The airport porter asked if I had rocks in the suitcases. Well, yes, sort of. What’s that, you’re saying? Providence, Rhode Island had food rationing? Well, there certainly wasn’t a Persian restaurant and home-style kosher brisket wasn’t anywhere I could see. She began eating the frozen kabob pieces from the bag and used a plastic spoon to scrape the tomato eggplant sauce, all while we were still in the taxi from the airport. As a Jewish mother, I knew I had done the correct thing – my grandmother would have been proud. Orsak says that if you are interested in your ethnic heritage, start with food as it is the longest-lasting cultural tradition. 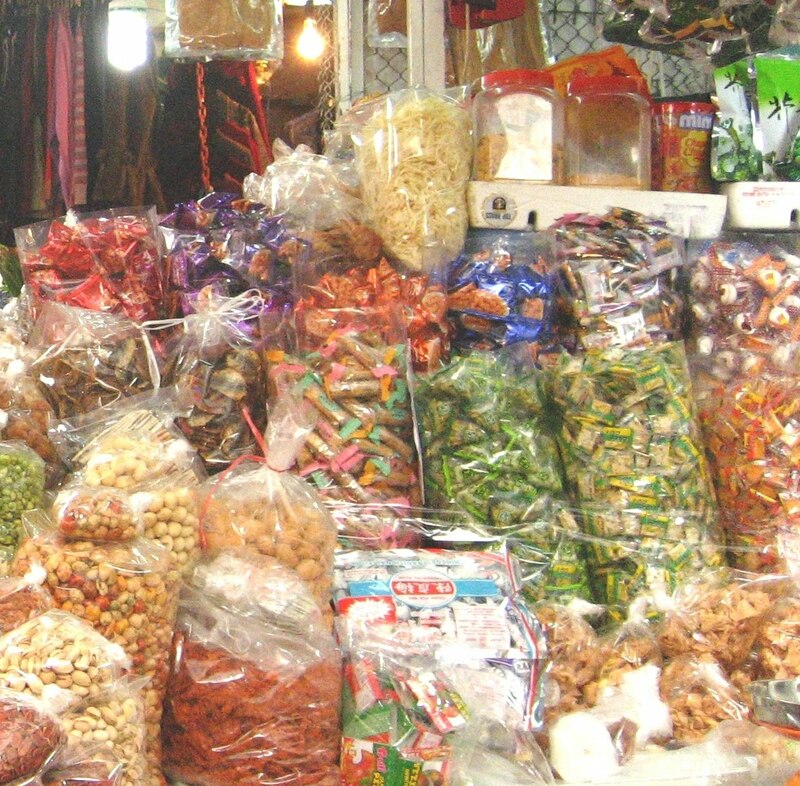 The favorite foods stay around long after a language or other traditions are lost. She suggests that people prepare family cookbooks to distribute to relatives, including a favorite recipe and who used to prepare it. Bring family heritage to life by sharing important traditional dishes. Who knows what will trigger an interest in genealogy and family history? The link also provides a recipe for a nice coffeecake – so try it out. 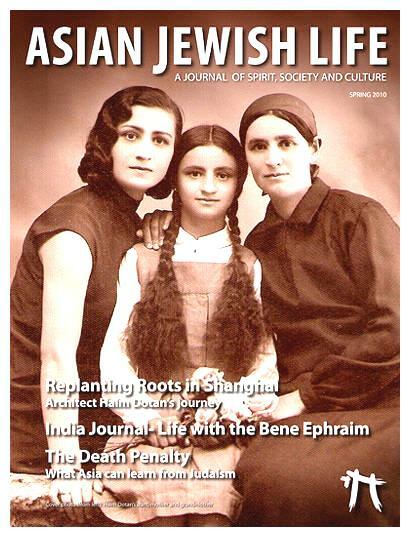 The new AJL spring 2010 issue is now online with stories covering India, Shanghai, Cambodia, foodies, book reviews, film and more. Readers and writers with Jewish Asian experiences are invited to submit articles; click here for more information. If you enjoyed this issue (the winter issue is also online), let Erica know, and tell her you learned about AJL at Tracing the Tribe. Feedback is always welcome. Tracing the Tribe loves Moment Magazine for its many interesting stories. If you are already a subscriber or friend of the mag, you’ll be receiving regular roundups, news items and quirky stories noticed by the editors. Readers can sign up for this free newsletter service here. Mondays will focus on politics; Wednesday, culture; and Friday, religion. Maxwell House started publishing Haggadahs in 1934 to give out free with the purchase of a can of coffee. It’s wide reach into American society “did more to codify Jewish liturgy than any force in history,” says one scholar. Approximately 50 million copies have been printed over the past 75 years. How did the Maxwell House Haggadah come to reign supreme in American Passover Seders for so many decades? Learn the true story in Moment’s intellectual food feast Talk of The Table. As any movie-goer should know, the Passover-table is the showcase for Jewish dysfunctional families. From Marjorie Morningstar to Woody Allen, Moment’s Film Watch spotlights some great Seder films! Horseradish has not always come in jars. A Moment writer recalls her grandmother’s horseradish garden and how growing and serving horseradish at the Seder following her death, she commemorates her grandmother’s legacy. The print/online March/April 2010 issue can be viewed here. Among the stories: An eggplant journey, Matzah Man, Haggadah art, and many others. 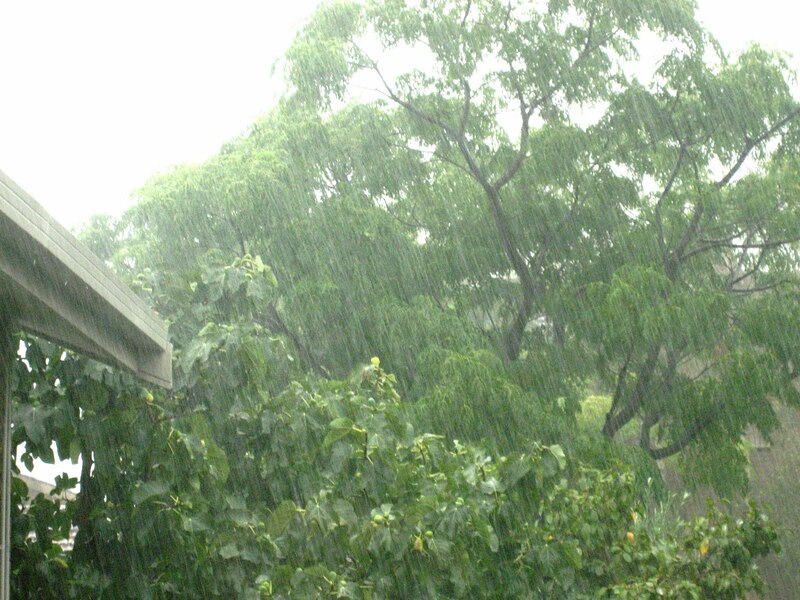 The weather report indicated possible showers today, and the heavens have really opened up, with thunder, rain and hail. Glad I’m inside today! After nearly two weeks of travel, jet lag has finally hit. This past week was spent kicking back, frequently napping and getting the travel fuzz out of my brain. My hosts, Ziva and Sam Fain, couldn’t be nicer, and their two pooches are wonderful. Last night, for Shabbat dinner, I cooked up a Persian Shabbat meal of abgusht, gonde, khoresht-e-lubia sabz, rice and golden tahdiq. None of the guests had ever eaten Persian food before and it seems this was a big hit. For readers unfamiliar with the cuisine: abgusht is a chicken soup flavored with handfuls of mint and parsley, carrots, parsnips, onion and lots more. Gonde are meatballs of ground chicken, grated onion, roasted chickpea flour, cardamom, turmeric, pepper and salt, cooked in the soup. Khoreshts are stews with meat and vegetables and/or herbs. Lubia sabz are green beans. This particular dish uses very lean stew meat, sauteed fresh green beans, lots of carmelized onion, crushed tomatoes, whole tomatoes, lime juice and cinnamon. Shirazi salad – finely diced tomato, cucumber, red onion dressed in lime juice, salt, pepper, and a little olive oil – was also on the table. Ziva has a beautiful herb garden, and there is nothing like the taste of fresh-picked herbs (two kinds of mint, flat-leaf parsley, basil, oregano and more). It really made a difference. She also has a small vegetable garden, and a big fig tree in her front garden. Dessert included watermelon and cantalope slices, strawberries and blueberries. This week, we visited the new Holocaust museum that is just opening – school groups are already going through it. I met many of the volunteers, and some of the JGS people, including Lionel Sharpe, on our quick visit. The conference starts tomorrow, so I’m trying to kick back and go over materials. I’ve connected with my long-lost cousins from Bobruisk who have lived in Melbourne for quite some time – they are still in shock over my phone call and one of the brothers and his family live only a few blocks from my hosts! They are Katsnelson and their mother was a Talalay. We will spend one day next week together. Another day will be spent with Bene Israel friends from India, who have lived here for many years. On Sunday, March 14, the plan is to be in a place called Kangaroo Flat for the Bendigo Family History Expo. My hosts are planning a visit down to Phillips Island to see the penguins (I love penguins). Sydney is also on the list as I will be seeing my cousins, Bob and Di Conley. Stay tuned for the conference first day report! Dimsum have been on my mind since I arrived. Traveling means enjoying good food with great people. Hong Kong has provided several opportunities this week to do just that. And we did it again today! Today, vegetarian versions were on the menu at Pure Veggie House in Coda Plaza. The same building also holds other restaurants serving hotpots, regular dimsum and more. We arrived at around 12.30, only one other table was occupied. By 1.15pm, every table in the place was filled; 1pm is lunchtime in HK. We sat at a large round table with a revolving glass center. Every dish looked delicious, but this group has gone there often and knew exactly what to order. We started off with what turned out to be fried bean curd skins. They tasted a bit like vegetarian bacon bits – chewy, crisp, interesting. The other dishes began arriving in bamboo steamers, small platters and bowls: transparent wild mushroom dumplings with black truffle sauce, steamed vegetarian BBQ buns (these were fantastic), turnip puffs (a yellow fried shell surrounding soft melting turnip), pure veggie siu mai, noodles in soup with sesame sauce and peanuts (very delicious), and wonton in red chili soup. Of course, green tea and jasmine tea were on the table. For our group of five, we ordered two of most items and stuffed ourselves silly. The bill? About US$10 per person. We could also have had other deep-fried pastries – such as wild fungus spring roll, vegetarian cake, pan-friend pumpkin cake or vegetable turnover – or other steamed offerings – fried rice in lotus leaf, steamed eggplant with bean paste, bamboo fungus bundle or steamed rice flour pancakes with vegetables or mushrooms, or another 15 rice or noodle dishes. Frequent diners get a 10% off card, which one of our group had today. I learned that there are two types of vegetarian restaurants. One serves dishes that look, smell and taste like various meat products but aren’t – such as platters of roast “pork.” The other type doesn’t try to imitate meat products, like Pure Veggie House. How did I enjoy it? A simple one-word answer: YUM! There were some interesting dishes on other tables and asked about them. One was a delicious looking spiced bean curd. Next time. We didn’t have dessert, but if we had room, we could have had sesame pudding, red dates and snow lotus seeds, red date pudding, or sweet rice dumplings. Back to the hotel to prepare for tonight’s talk. More later. Even genealogists need a break occasionally. 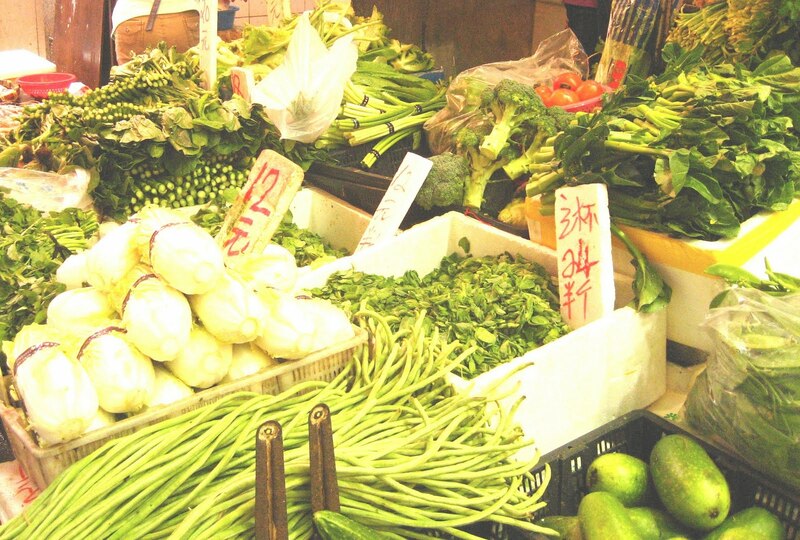 This morning, Erica Lyons and I walked through the lanes of a market. Here are some shots.